BUPD Sgt. Roy Betz demonstrates a self-defense move during the workshop. Photo by Regan Koster. The attacker had the victim’s arms pinned to her sides in a vice grip. Multiple voices in the Irvington Community Room raised suggestions: step on his toes. Knee him in the groin or the gut. Scrape your heel down his shin. Hammer punch to the thigh. BUPD Sgt. Roy Betz, who oversees emergency preparedness and training, dropped his bear hug before the student could deliver any of those debilitating maneuvers. The point was made, though. She was not out of options. Nor was she defenseless. On Jan. 26, the SGA BUPD Committee and CHAARG, a women’s fitness group on campus, organized an event to teach students self-defense. The event was open to all students, but all 35 attendees were women. 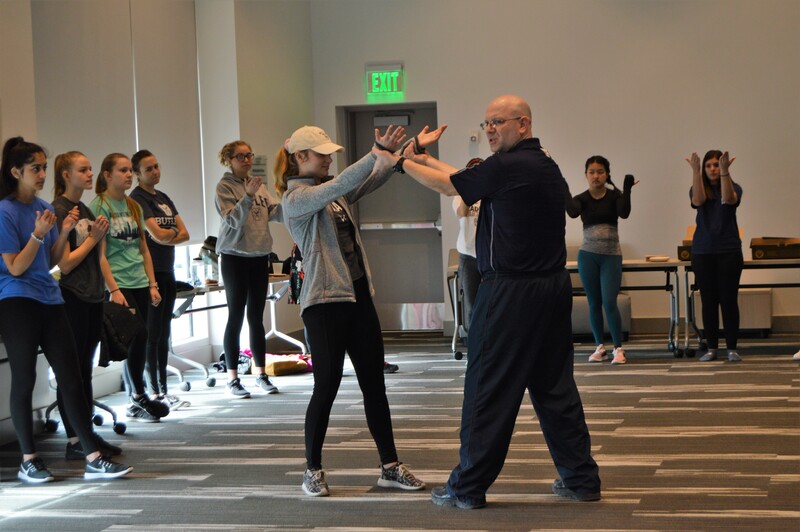 Several BUPD officers, including Betz, take turns teaching the Physical Well-Being course, Women’s Self-Defense, offered every semester. Emmy Wendling, a first-year pharmacy major, heard about the event through her resident assistant. “Hopefully my brain works if I’m attacked,” Wendling said, but also added that she felt empowered by knowing self-defense techniques. Wendling said having BUPD officers lead the event showed their commitment and devotion to protecting students on campus. Betz, who has taught self-defense for over 20 years, said he cannot force, nor does he expect, people to use these techniques. It depends on how an individual reacts in stressful situations. Kelly Stone, a first-year entrepreneurship and innovation and marketing major, is on the SGA BUPD Committee. Stone said the goal of the event was to create a social and learning experience where police officers and students can interact. “It was fun seeing the officers joke around, even in a serious setting,” Stone said. When Betz demonstrated what to do if an attacker grabbed your ponytail, he instructed the class to imagine he had really long hair. It might have been difficult to picture, considering Betz is bald, but he elaborated: really long, luscious, red curls. “He’s put a lot of thought into this,” joked Randy Wray, a BUPD officer in attendance. The maneuver to get out of a ponytail grab, though, was no joke. It is “quick and violent,” Betz said. It will not sprain somebody’s wrist — it will break it. Participants partnered with each other, one as the assailant and the other as the defender, to practice the movement slowly. If an assailant grabs the base of your ponytail, place your hand on top of theirs, pulling them toward you. If they place another hand on top of yours, do the same and roll under your arms. Betz demonstrated several other techniques until students could perform a variety of defense maneuvers, including two types of kicks, a straight punch, elbow jabs and how to get out of a chokehold. Betz emphasized to always aim a punch or kick through the attacker, which will give the strike more strength and momentum. When showing a knee-to-groin maneuver, Betz said to grab the attacker’s shoulders as leverage and pull them even harder onto your knee. He motioned to Wray’s groin area and said, “Whatever’s here —” Betz pointed to Wray’s groin area “— you want it to end up here.” Betz pointed to Wray’s head, earning a few laughs.